The development of a code of flag signals seems to have exercised a great fascination on many minds, and the result has been that until the general adoption of the International code things had got into a somewhat chaotic state. Some systems had many excellent points in them, while others broke down under the strain of practical use. In some cases, too, the claims of patriotism influenced the choice, it being difficult for an Englishman or an American to believe that the scheme of a Frenchman or German could possibly be better than the home-grown article. The systems best known in this country are the Admiralty codes of 1808, 1816, and 1826, Lynn's in 1818, Squire's in 1820, Raper's in 1828, Philipps' in 1836, Eardley Wilmot's in 1851, the code of Rogers, the American, in 1854, the French code of Reynolds in 1855, and the system devised by Marryat in 1856, all being superseded by that of the Board of Trade. The International code of signals was prepared and first published in April, 1857, in accordance with the views and recommendations of a Committee appointed by the Lords of the Privy Council. Three members, Admiral Beechey, Captain Robert Fitzroy, and Mr. J. H. Brown, the Registrar-General of Seamen, were named by the Board of Trade; one member, Admiral Bethune, by the Admiralty ; an elder brother, Captain Bax, was appointed as a member by the Trinity House; Mr. W. C. Hammett and Captain Halstead were the members named by Lloyds; while the Liverpool Shipowners' Association, and the General Shipowners' Society, each, by the nomination of a member, had a voice in the discussion. After a deliberation of more than a year, the examination of the thirteen then existing codes and due attention to any practical suggestion made to them, a mature and valuable scheme was promulgated. 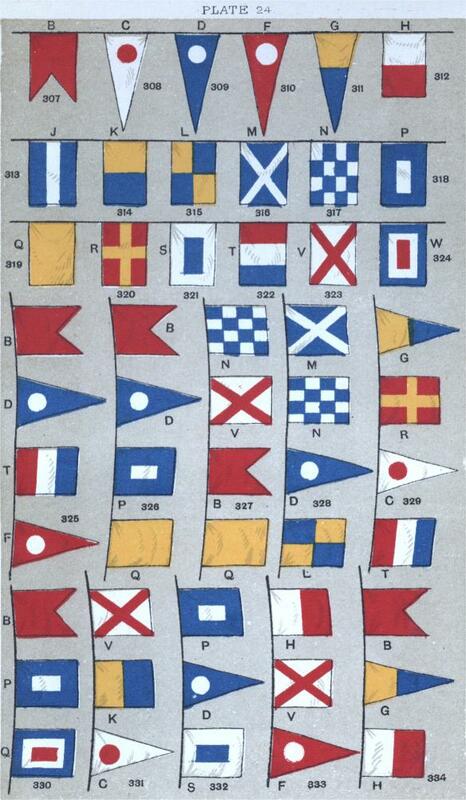 Eighteen flags in all, viz., one burgee, four pennants, and thirteen square flags, were employed, and these represented the consonants of the alphabet. These are depicted in the three upper rows on plate XXIV. Figs. 307 to 324, the letter it stands for in the code being placed by each flag. These flags are combined in various ways, either in twos, threes, or fours, and are always read downwards, thus Fig. 325 must be read B.D.T.F ; if we read it the reverse way, as F.T.D.B, it would have an entirely different significance. Of the two-flag signals we have three varieties. Should the burgee, Fig. 307, be uppermost it constitutes what is termed an attention signal; thus the hoisting of B.D signifies, "What ship is that?" If the upper flag be a pennant C.D.F. or G it is a compass signal; thus G.F means west-north-west-half-west. If a square flag be uppermost it is an urgency signal; thus, N.C signifies " am in distress," or N.J "am driving, no more anchors to let go." Signals made with three flags are not classified according to the upper flag; they relate to subjects of general inquiry or communication of news. In the lower portion of Plate XXIV. we have given five examples of these. Fig. 330, flags B.P.Q, asks "Do you wish to be reported?" while the hoisting of P.D.S, see Fig. 332, replies, "Report me to Lloyds' Agent." Fig. 333, H.V.F, asks, "Do you want assistance?" while Fig. 334, B.G.H, enquires, "Has any accident happened?" Fig. 331, made up of flags V.K.C, gives the reassuring answer to both enquiries - "All safe." As weather signals, we find "barometer rising" indicated by G.F.W; "barometer falling" by G.H.B; and "barometer standing," by G.H.C. Fine weather is prognosticated by the group H.M.S; a breeze off sea is foretold in the combination H.S.V; and a breeze off land by H.S.W. Signals composed of four flags are divided into different sections again, according to the form of the uppermost flag employed. If this upper flag be either of the pennants C.D or F, it indicates that the signal is what is called vocabulary. If the upper be the burgee - the letter B of the code - it is a geographical signal; thus, any vessel beating up channel and seeing Fig. 325, made up of B.D.T.F, hoisted from a lighthouse, would, even if uncertain before, know their position, as this signal is the one specially assigned to the Eddystone Fig. 326, the letters B.D.P.Q, signifies that the vessel flying it hails from the port of London, while B.F.Q.T. is Edinburgh, and so on. All names of ships are expressed by four letters, thus N.V.B.Q is the code signal (Fig. 327) of the steamship Germanic; M.N.D.L (Fig. 328) that of the Hesperus; and Fig. 329, made up of G.R.C.T, is the special grouping assigned to H.M.S. Devastation. All these names are recorded in the Shipping List, so that two vessels passing each other in mid-ocean are able at once to determine each others' names if within sighting distance of the flags run up. Should we see a stately liner coming to port, flying M.T.L.Q, we recognise that it is the Australia of the great Peninsula and Oriental Line, but if she runs up L.H.T.B then she is the Orient Company's boat Orotava. Some names occur frequently, thus other Australias, belonging to various owners, are distinguished by the code signals R.L.H.V, J.T.G.K, M.P.F.C, M.Q.N.G, M.T.W.D, W.F.T.N, etc., etc. Figs. 355, 356, 357, 358, 359 are all code signals of various Australias. While the Peninsular and Oriental Company has also a Victoria, K.M.Q.F., they have no monopoly of the name. There are numerous other boats of that popular designation, but even when vessels have the same name no two vessels ever have the same code letters assigned to them. Other Victorias, for example, are differentiated, as W.Q.M.N., L.S.H.R, K.P.G.Q, M.K.C.H, M.S.P.B, M.Q.C.J, L.D.F.II. T.R.B.N, K.J.H.P, T.D.R.F, etc , etc. Figs. 350. 351. 352, 353, 354 are all Victorias; and Figs. 360, 361, 363, 363, 364 are the flag-signals of various Britannias. Ours readers will see at once how distinctive they are. Figs. 335 to 349 inclusive are the special flags of well-known steamships of the Peninsular and Oriental, the Orient Line, and the Compagnie Générale Transatlantique. Should the vessel be a yacht, it is the Aline if she shows the flags P.W.N.D; the Star of the Sea if her signal is T.N.B.H; but if it is the Meteor we shall be aware of the fact from her hoisting the four flags L.C.T.P. The flag signal of the Valkyrie is L.F.M.G. Applications for the allotment of a code-signal, for the purpose of making ships' names known at sea, should be made, if of the United Kingdom, to the Registrar General of Shipping, Custom House, and, if belonging to a Colony, to the Registrar at the port to which the vessel belongs. If a ship to which this International Code Signal has been alloted is reported wrecked, lost, or sold to a foreigner, and her register is in consequence cancelled, the signal letters allotted to her are also cancelled, so that if the ship is afterwards recovered or re-purchased from foreigners, either in her original or some other name, new signal letters will be necessary, and the owner must make application anew for another allotment, as the signal letters the vessel originally bore may have been in the interval re-allotted. The flags to be hoisted at one time never exceed four, and it is an interesting arithmetical fact, that, with these eighteen flags, never using more than four at a time, over seventy-eight thousand different combinations can be made. With these flags, only using two at a time, 306 different arrangements can be made, while by using three at a time we get 4,896 possibilities, and by using four at a time, we can make 73,440 changes; a total in all of 78,642 variations made from these simple elements. Marryat's code, prior to the introduction of the International, being the one most in use, twelve out of its sixteen flags were, to save expense, incorporated in the new code. Their significance was, however, entirely changed. Marryat's flags, too, were numerals, while the International code, as we have seen, has its flags named after the letters of the alphabet. Proposals are in the air to add eight new flags to the code, the X, Y, and Z, and the five vowels, since it is held that even the great number of combinations now possible may in time not suffice, The reason for the absence of the vowels is a somewhat curious one. Directly vowels are introduced we begin to spell words, and it was found that amongst the thousands of combinations possible, would be presently included all the profane, obscene, and otherwise objectionable four-letter words of the whole world. To hoist D.B.M.N could offend no one's susceptibilities, but to run up the signal D.A.M.N in response to an enquiry is quite another matter, and it must be remembered that as this code is used by all civilised nations, a word that is merely meaningless in one country might be most offensive in another. An English Captain might hoist as a necessary signal J.A.L.P. or F.L.U.M. and see no possible objection to it, but "jalp" or "flum" might to the people of some other nationality carry a most atrocious significance. It is a practical necessity that all connected with the sea should understand the use of the International code, therefore, the Lords Commissioners of the Admiralty require that all Royal Naval Reserve men who act as Masters or Mates of ships should be instructed in its working, and the Board of Trade makes like requirements from all candidates for Masters' or Mates' Certificates. Its International character is a most valuable feature, as by its use two captains, say a Dane and a Greek, or a Russian and a Spaniard, who, on the quay, could not comprehend a word of each other's language, can at sea, by this common flag-language, come to a perfectly clear understanding of each other's need, or impart any information required. It is the only code used at the signal stations around our coasts. Lloyds' have thirty-three of these signal stations at Dover, Beachy Head, Lundy Island, Dungeness, Flamborough Head, St. Catherine's Point, North Foreland, and other conspicuous points on our line of ocean traffic, and abroad again at Aden, Ascension, Gibraltar, Bermuda, Honolulu, Suez, Perim, Malta, Teneriffe, and elsewhere, and here too, the International is the only code recognised. This "Lloyds," that we may see daily referred to in the newspapers, is a Corporation that, amongst other marine business, distributes shipping intelligence. A Mr. Edward Lloyd, in the seventeenth century, kept a coffee house in Tower Street, which in time from the daily gathering there of merchants, captains, and others interested in marine affairs, became a centre for shipping and underwriting news and business. In the year 1692 it was moved to Lombard Street, and in 1774 the coffee supplying part of the business was abandoned and rooms were taken in the Royal Exchange. During the wars with Napoleon, the Govern, ment was often indebted to the Committee of Lloyds' for the earliest information of important events all over the world. Lloyds' has its agents in every port, and by its complete organisation and the potent aid of the telegraph, the shipping business of the world is brought day by day before us. Vessels spoken far out on the ocean are reported by the vessel that spoke them immediately on its arrival at any port. Thus a sailing-vessel journeying from London to Vancouver may be five months or more before it touches land, but during that time it is sighted by other vessels from time to time, and these report having seen it, and that all was well on board. So the mother knows that her son, who is parted from her by thousands of miles of ocean, has got thus far in health and safety; and the owners of the vessel learn that their venture has so far surmounted the perils of Cape Horn and the other dangers of the deep. The good ship is drawing nearer at each report to the end of her long voyage, and on arrival at last off Vancouver, as the land is sighted, the signal flags run up once more to the masthead, the news of her coming is flashed across continent and ocean, and the London newspaper of the next morning contains the brief notification that far exceeds to anxious hearts all else of interest its broad pages may contain. Familiarity, though it may not necessarily breed contempt, dulls the sense of the wonder of it all, and yet how marvellous it is! We have before us the Standard, that came into our hands about seven o'clock this morning, and we find from it that yesterday the Gletishiel had arrived at Hong Kong, that the Arab, from Cape Town, had just put in at Lisbon, that the Sardinian, from Quebec, had reached Moville, that the Circassian was safely at New York, that the Orizaba, speeding on to Sydney, had at 2 a.m. passed the desolate shores of arid Perim, that the Danube, from Southampton, had at 6 a.m. entered the harbour of Rio Janeiro. Of this, and much else of the same tenor, may we read in a space of a quarter-column or so of the paper as we sit at breakfast and see pass before us a panorama of world-wide interest and extent; and to accomplish this result, the flags we have figured have been a potent factor. Though we have covered much ground, it must have been patent to all readers who have thus far companioned us that much detail was necessarily omitted, unless our book had to grow to the dimensions of an encyclopaedia. It would probably, for instance, take some fifty figures or so to give all the distinctive flags of the various government departments, official ranks, etc., of a single Great Power. We trust nevertheless that while our labours have been by no means exhaustive, they have been instrumental in showing that there is much of interest in flag-lore, and that an increased knowledge and appreciation of our subject may be one result of our pleasant labours, and prove full justification for our work.